Known world-wide as the standard introductory text to this important and exciting area, the seventh edition of Gene Cloning and DNA Analysis addresses new and growing areas of research whilst retaining the philosophy of the previous editions. Assuming the reader has little prior knowledge of the subject, its importance, the principles of the techniques used and their applications are all carefully laid out, with over 250 clearly presented four-colour illustrations. 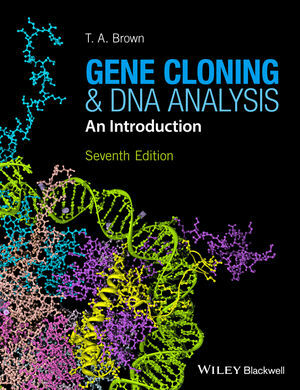 Gene Cloning and DNA Analysis remains an essential introductory text to a wide range of biological sciences students; including genetics and genomics, molecular biology, biochemistry, immunology and applied biology. It is also a perfect introductory text for any professional needing to learn the basics of the subject. All libraries in universities where medical, life and biological sciences are studied and taught should have copies available on their shelves. Professor Brown became fascinated with the natural world at a young age. He began his research career studying the effects of metal pollution on microorganisms and the tolerance that some plants display to high concentrations of toxic metals. He then became excited by DNA and worked on mitochondrial genes in fungi in order to learn the new (in those days) techniques for gene cloning and DNA sequencing. He contributed to the discovery of mitochondrial Group 1 introns and to work that described the base-paired structure of these introns. He then became interested in ancient DNA and was one of the first people internationally to carry out DNA extractions with bones and preserved plant remains. This work has required close collaboration with archaeologists, both in Manchester and elsewhere, and led to current interests in the origins of agriculture, genetic profiling of archaeological skeletons, and the evolution of disease. Professor Brown was appointed Professor of Biomolecular Archaeology at UMIST in 2000 and was Head of Biomolecular Sciences at UMIST from 2002–2004, the two years leading up to the merger of UMIST and the Victoria University of Manchester and the successful creation of the new Faculty of Life Sciences. He then acted as Associate Dean for Communication and External Relations in FLS until 2006, and more recently as Head of the Molecular Systems Section. Professor Brown has written a number of undergraduate textbooks including Gene Cloning and DNA Analysis: An Introduction (6th edition, Wiley-Blackwell, 2010) and Genomes (3rd edition, Garland Science, 2006). As well as new editions of these books, he has written a new introductory genetics textbook published by Garland in 2011 and, with Keri Brown, a book on Biomolecular Archaeology published by Wiley-Blackwell, also in 2011.